The times would seem to favor the rise of renewable energy--power derived from sources such as solar, wind and biomass. Renewables have grown up in recent years, attracting blue-chip investors and fostering supply chains that span continents. Technologies have improved and costs have fallen. But renewable energy still hasn't outgrown criticisms that have dogged it for years: It remains too expensive to compete head-to-head with fossil fuels, and it is too dependent on government subsidies. Most renewable energy faces another major obstacle. Much of it remains intermittent--and technical advances that could make it a reliable, full-time power provider remain elusive. Wind power--the largest and most mature of the emerging renewable-energy sources--still requires government subsidies and mandates. The cost of solar power has plummeted in recent years, but it is competitive with coal and natural gas only in a few scattered markets where the price of electricity is very high. And solar installations that can generate as much electricity as a natural-gas plant are sprawling. The recent rapid growth in natural-gas drilling in shale rock promises to keep prices low, making it harder for renewable energy to compete. Neither wind nor solar can deliver electricity upon demand, a critical part of the power-supply business. The electricity only flows when the wind is blowing or the sun is shining. Storing electricity for future use is tough and will require breakthroughs. "Cost-effective grid storage could be a game-changer," noted Raymond James analyst Pavel Molchanov recently, "but that's in the realm of R&D for the time being." Building a new transmission grid to move electricity from the sunny desert and wind-swept Great Plains to coastal cities will likely prove contentious and expensive. The hunt for a fuel source to replace crude oil is also sputtering. Turning corn and sugar cane into ethanol certainly works, but with rising global food prices, using arable land for edible goods is compelling. And federal rules, designed to protect car engines, limit ethanol to no more than 15% of a gasoline mix for most vehicles, hindering its growth. Efforts to convert wood scraps, municipal solid waste and energy crops--advanced biofuels derived from algae and switch grass--into fuel have been an enormous struggle. Still, companies haven't given up the hunt for alternatives to oil, natural gas and coal. The energy market is so large that securing even a small slice means tremendous profit potential. Governments also remain interested. Getting to the front of a new global industry could mean creating an engine that generates jobs and economic output for generations. Moreover, renewable energy, including geothermal and recycled municipal waste, is cleaner than existing fossil fuels, reducing carbon-dioxide emissions as well as local pollutants. Germany and China saw the largest investments, between $25 billion and $30 billion each in 2009, by companies manufacturing or buying renewable-energy equipment, and government grants for research and deployment of clean-energy and energy-efficient technologies. The U.S. ranked third with a $15 billion expenditure in 2009, according to Ren21, a Paris-based renewable-energy-policy network. Federal forecasters envision the U.S. dependence on burning coal to generate electricity will drop to 42.9% of total electricity generation by 2020 from 44.5% in 2009. Nuclear power, hydro energy and natural gas will also have slightly smaller slices of the pie. Meanwhile, use of renewables, while still a small piece, will nearly double to 6.9% from 3.7%. "The question is," says Frank Wolak, director of the Program on Energy and Sustainable Development at Stanford University, "is society willing to pay for it?" And, he asked, why should society pay for it given how much fossil fuel is available and how relatively cheap it is? Supporters of renewable energy say governments should continue underwriting its growth. "By generating electricity with renewables, you are generating emission-free electricity. But that's a bonus. There are other reasons. You have local environmental benefits, local air quality and health issues. You have the economic benefit of job creation," says Virginia Sonntag-O'Brien, executive secretary of Ren21. 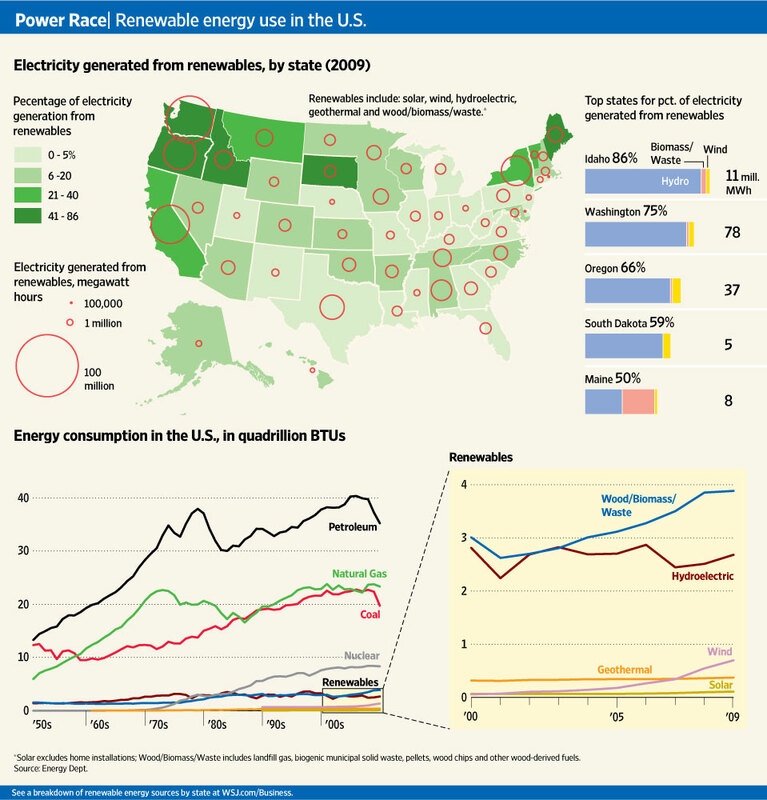 Others contend there is a heavy price for relying too much on renewable energy that could create a broad economic toll. "You are making energy more expensive and the cost of production greater. You are reducing consumers' income because their energy costs go up," says David W. Kreutzer, a research fellow at the conservative-leaning Heritage Foundation in Washington D.C. This is changing as renewable technologies get less expensive and more efficient. Energy Secretary Stephen Chu said recently that he believes wind and solar wouldn't need subsidies to compete within a decade. In Oregon, the potential scale of renewable energy, and its dependence on government money and policies, is coming into view. The largest wind farm in the U.S. is under construction in the state along the Columbia River Gorge. It features some of the most advanced and largest wind turbines being built. When completed next year, it will have the capacity to provide electricity to one million customers. But the $1.9 billion Shepherds Flat project needed a government-created tail wind. The Energy Department provided a $1.06 billion federal loan guarantee so that General Electric Co. and Caithness Development LLC could find lenders to finance the project. The U.S. Treasury will provide a $490 million cash grant once Shepherds Flat is up and running. The kilowatts generated will be purchased for the next 20 years by utility Southern California Edison. The Edison International unit faces a state requirement that 20% of its electricity come from renewable sources, which gets bumped to 33% by 2020. A comparably sized natural-gas power plant would cost about $865 million, or less than half the cost of Shepherds Flat, according to energy consultant IHS Cera, and wouldn't require government support. But while it may cost more to build the wind farm, the gas plant would need to purchase fuel to generate power, and natural-gas prices have been volatile in the past decade. For the owners of Shepherds Flat, the cost of wind is free, and for Southern California Edison, the utility's 20-year agreement is for a fixed power price that won't increase. While renewables are more expensive today, the price may look good in two decades. "There may be some point where we look back and say, 'Wow, what a deal we got from these renewables,' " said Marc Ulrich, vice president of renewables at Southern California Edison.